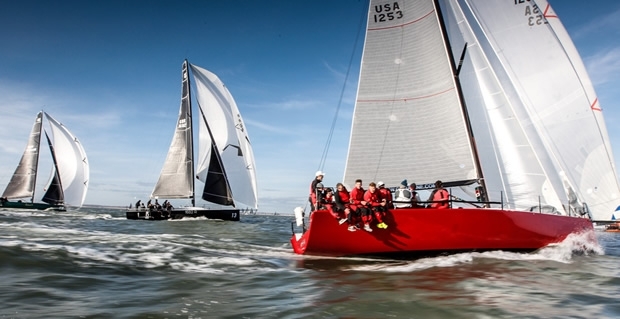 High speed, adrenalin pumping, ultra-competitive racing came to the Solent today in what many agree is the most exciting development to have taken place in big boat keel boat racing in the UK for decades. The long-awaited advent of competition for the new Fast40+s, the big boat class at the Royal Ocean Racing Club’s Easter Challenge, coincided today with chilly, but summery conditions. Three races were sailed with the wind peaking at 15-20 knots during race two. Among the ten Fast40s, there was a different winner in each race, but ultimately there were two stand-out performers in American William Coates’ Ker 43 Otra Vez and Peter Morton’s brand new Carkeek 40 Mk3 Girls on Film. They won the third and first races respectively, while Sir Keith Mills’ Ker 40+ Invictus claimed race two when the Fast40+s were sailing at wind speed. Greenhalgh was pleased that most teams posted good results today. Himself a former Volvo Ocean Race winner and 18ft skiff and International 14 World Championship, Greenhalgh calls tactics on Invictus which today posted a 6-1-8 scoreline. This leaves them third overall, six points adrift of Girls on Film and tied with two modified GP42s, Tony Dickins’ Jubilee and South African Mike Bartholomew’s Tokoloshe II. Invictus got buried at the start of the first race, got away cleanly in race two and then suffered a mishap coming into the top mark in the final race that cost them. “This is about close racing and not making mistakes,” advises Greenhalgh. leader by two points today is Otra Vez. Fast40+ crews can include up to five ISAF Cat3 ‘professionals’ of their 11. Sailing with Coates are heavyweight Volvo Ocean Race veterans Steve Hayles, Luke Molloy and Phil Harmer. While the Fast40+s stole the show today, in the other three classes there were also standout performers, including RORC Admiral Andrew McIrvine on his First 40, La Réponse, whose two bullets in today’s final races, give him a three point lead in IRC Two. In IRC Four, it is the closest at the top with Sam Laidlaw’s Quarter Tonner Aguila, a mere half point ahead of Harry J. Heijst’s perennial S&S 41 Winsome. In IRC Three the latest hardware is prevailing in Tom Kneen’s Sunrise. This is a JPK 1080 sistership to last year’s Rolex Fastnet Race winner, Courrier Du Leon. Today Kneen and his Plymouth-based crew were top scorers posting a 1-2-2, despite having only had the boat for three weeks and today being just the third day of racing her. “We had an Elan E4, in which we had a brilliant season last year and learned a lot. I was looking for a boat of this size which would be competitive and so far it has been. I am absolutely delighted,” said Kneen, who intends to enter the selection for the British team in this year’s Brewin Dolphin Commodores’ Cup. While Kneen has had to adjust from wheel to tiller steering over the last few days, today came good he felt because of the first class effort of the crew, which includes five who sailed with him last season. For this time of year, it would have been hard to beat today’s conditions. Sadly tomorrow the wind is looking tougher with gale force gusts predicted for the afternoon. Principal Race Officer Stuart Stuart Childerley is keeping fingers crossed that conditions will be sailable in the morning before the front arrives.